It seems to be baby season here !!!! My daughter is due to have her daughter "Madeline" in April and my friend at work will get her grand daughter towards the end of this week so now I am rushing to get this baby blanket that I started for her finished. 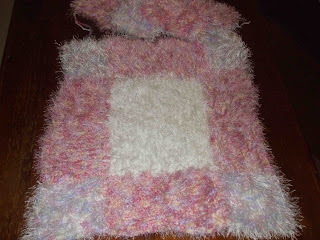 I knit powder puff and ostrich wool together and make patchwork squares. It ends up really really plush. I back it in plush polar fleece so it is super cosy. Hopefully I will get it finished tomorrow night and show you the finished product then. What a gorgeous present for a baby. Hi Fiona, I have given your blog an award, if you visit you can read about it and pick it up. 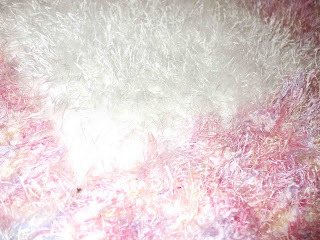 That blanket wants me to think about winter, It does look lovely , love the wool you have chosen. That really does look cosy!! oooh ya making me clucky! Hey, just wanted to let you know your parcel is on its way!